AGT Battery carries IMPRES Smart Energy Batteries, revolutionary batteries that allow you to talk longer, work smarter and spend less in the long run. AGT Battery is here to educate users who are unsure how these top of the line batteries work. AGT Battery Supply, a trusted supplier of Motorola batteries and Motorola portable radio parts and accessories, has expanded their extensive collection to include the new IMPRES Smart Energy Batteries. Users are raving about this revolutionary new battery that utilizes new technology. If your battery has developed a memory, this technology removes it automatically without the user having to manually ‘program’ the conditioner charger to remove it. 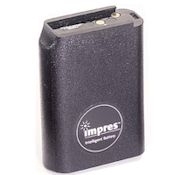 Users also love how the IMPRES Smart Battery reduces the number of spare batteries that you have to buy and increases the time before you need replacement batteries. Even better, IMPRES batteries can be charged 150 additional times and last 43% longer. These batteries are extremely efficient. They show you exactly how much capacity is left, so you can squeeze every bit of energy out of each battery. You no longer have to guess or carry spare batteries just in case. Now you can know exactly how much and be prepared when you need to be. The IMPRES Motorola batteries survive day-to-day abuse and the hazards of the workplace, making them a leading choice among rescue workers. All and all this innovative new battery lasts longer than other batteries, allowing you to talk longer, work smarter, and spend less in the long run. AGT Battery Supply offers the IMPRES Smart Energy Batteries at a competitive price, allowing you to buy more for less. Their worldwide shipping abilities guarantee that you will have the batteries that you need, no matter where you are. The ample experience they have with the military specifically qualifies us to help any deployed personnel as quickly and inexpensively as possible. You can feel confident you will receive the best service for any urgently needed supplies.